The Chateau de Malmaison is already mentioned in the 14th century and has always belonged to rich families. But the most famous residents are undoubtedly Napoleon and Josephine. Josephine was a widow of 32 years when she met Napoleon Bonaparte, a Corsican General, 6 years younger than she was. He fell like a rock for her and they got married in March 1796. When Napoleon was away on Campaign to Egypt, his wife bought a small castle with surrounding estate just outside of Paris: Château de Malmaison. At first napoleon was not thrilled with her expensive purchase, but he grew to love it at the end. 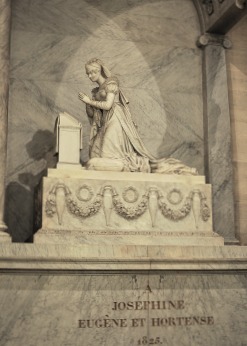 Josephine hired two architects, Percier and Fontaine to start the costly renovations in the style of classical antiquity. It became a lovely little chateau where Napoleon and Josephine spend their most happy times. From 1800 to 1802 it even served as the headquarters of the French government. 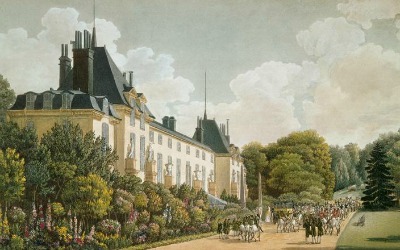 Napoleon rather stayed at Chateau de Malmaison with his beloved Josephine than at the official Tuileries Palace in Paris. Napoleon went on many battles in distant exotic lands and brought back enough information and artifacts to inspire Josephine and to expand her collection. From Egypt came the obelisks, Sphinxes and pyramid shapes found in the interior of Malmaison. In 1803 Ferdinand IV, King of Naples chose the most beautiful items found during excavations in Pompéi and Herculaneum to donate to the first consul of France and his consort. 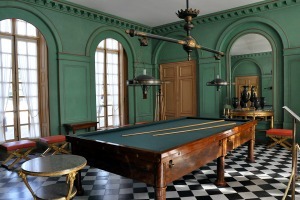 Joséphine added these gifts to the collection in Chateau de Malmaison: the gift consisted of 40 Greek vases, thirty-nine Roman bronze sculptures and objects from everyday life such as elegant oil lamp standards, three bronze tables and all kinds of tableware. Also a bronze helmet, bronze shoulder and leg pieces and weapons of the gladiators in Pompéi were part of the gift. The most striking was a series of frescoes which were carefully removed from the walls of a Pompeii villa. They depicted the god Apollo and the nine muses. 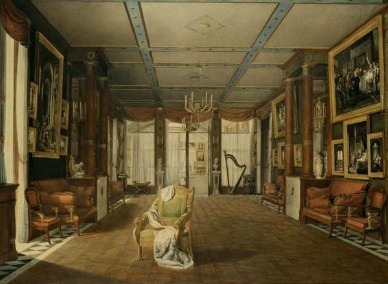 Empress Joséphine admitted a Grande Galerie of antiques to the elegant music room and she hired a conservator who catalogued each item and draw copies of them. In Napoleon's study, where he was planning his campaigns, a secret staircase lead to Josephine’s appartments. When they were together she slept in the sumptuous bedroom, but she choose a smaller, more simple room when he was not with her. In addition to her art collection Josephine was also very fond of gardening. She collected cuttings and seeds from all parts of the world, including from English and French nurseries, despite the fact that these countries were at war with each other at the time. The gardens had exotic species plants and a famous rose garden, where still the famous "rose of Malmaison" is flourishing. This was the first collection of Europe consisted of approximately 250 varieties of roses. The gardener André Dupont was responsible for the collection. The garden of Malmaison was a true theme park, with a zoo where the first zebra and the first Black Swan of Europe could be found. Josephine had a heated orangery and a greenhouse, build. 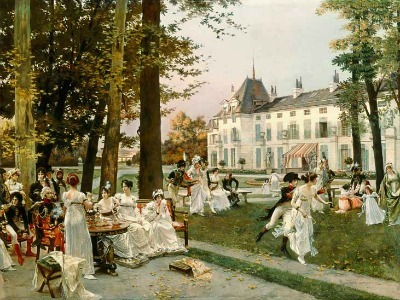 Many events were given in these lush gardens, Josephine liked to share her wealth. You had not made it at the time if your were not invited to one of Josephine’s soiree’s. After her death an astonishing collection of 13,000 bottles of wine from all over the world were found in the cellars of her Chateau de Malmaison. In addition, proof of her Creole roots, she also had a very nice collection of rum. She was not a great boozer herself, these supplies where mainly for her guests. The park is now much smaller than at the time of the Empire, but is still worth a visit. 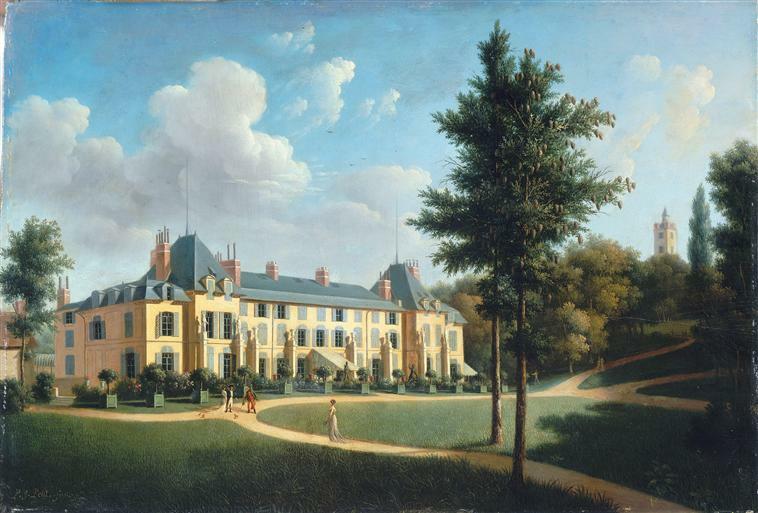 After the dead of Josephine on 29 May 1814 in her bedroom on the first floor of her beloved Castle her children Eugène and Hortense inherited the Chateau de Malmaison. But because Joséphine bequeathed high debts, so they had to sell most of her possessions and the magnificent archaeological collection was sold and became scattered. The Tsar of Russia, Alexander I, was in the right place at the right time! Not only was he the Allied Victor, he also became the buyer of Joséphine’s famous art collection. For a then astronomical amount of 940.000 French francs Alexander already bought a large number of paintings and sculptures in 1815. Joséphines daughter Hortense and son Eugene continued to enjoy the protection of Tsar Alexander's and Joséphine’s grandson later marries with a Romanov Princess, making the families relatives. 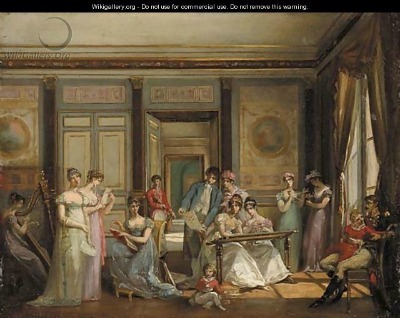 That’s why many parts of the collection of Josephine eventually found their way to the Hermitage. The collection that was donated by the King of Naples, however, remained together and ended up in the Louvre museum in Paris. Nowadays a museum is located in the Chateau de Malmaison. 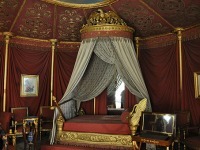 It gives a good view of the personal life of Napoleon and Josephine and give some fascinating insight into their lives. Malmaison Museum is open every day except Tuesday. 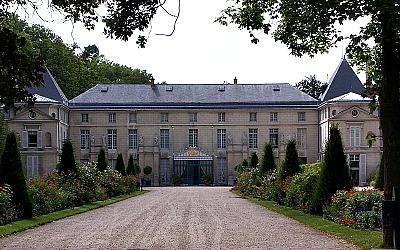 Château de Malmaison is located in the city of Rueil-Malmaison about 12 km from Paris. RER: Line A to station "Grande Arche de la Défense" and then take bus n°258; get of at the "Le Château" stop. Be aware the Chateau closes at 12.30 for one hour for lunch so plan your visit in the early morning or afternoon. The little village of Reuil is rich in cafés and churches and you can visit the beautiful local church of Saint-Pierre-Saint Paul where empress Josephine is buried.